Corruption in our country has become a national disaster and the effects are so many and so deadly that many of us cannot fully fathom them. Citizens are feeling helpless and held at ransom by a Government that they elected into office with so much hope for better leadership. Well, that good leadership has has not worked out as far as safeguarding our national wealth and making sure that it is used fairly is concerned. We’ve been hit by scandal after scandal and its even surprising that we’re surviving it all! The powers that be are not looting from all angles. Yes, the corruption we’re aware of over the years and which many of us are becoming apathetic about is escalating and is at its worst ever. Other than being reported every single day on local media, it is now out into the world and onto international media. Corruption is our farmers breaking their backs tilling land every day and never getting enough income even to educate their children. Corruption is death, disability and maiming on our roads because corrupt officials have taken most of the money that would have made better quality roads. It is policemen on our roads who have let rogue drivers run amok, break the rules and bring on the accidents. Corruption is our children playing in dump sites and getting all sorts of infections because the powers that be are diverting more money to their pockets than they’re putting into garbage collection. Corruption is then death in hospitals due to corrupt procurement methods among Government officials and spiriting away of drugs by hospital staff. Corruption is Kenyan citizens spending huge sums of money to travel to countries abroad for treatment of diseases that could have been treated locally had the money for equipment all not been ‘eaten’. It is an education system that is churning out half-baked graduates right through primary school, secondary school and even colleges because poor education starts right from free primary school system, and this is attributable to corruption. Corruption is undermining rule of law and enabling human rights abuse and organized crime and threatening our stability and national security as a country. Corruption continues to be the single greatest obstacle to economic growth and development in Kenya. It is costing people jobs and deterring investors and international partners that Kenya seeks to attract. 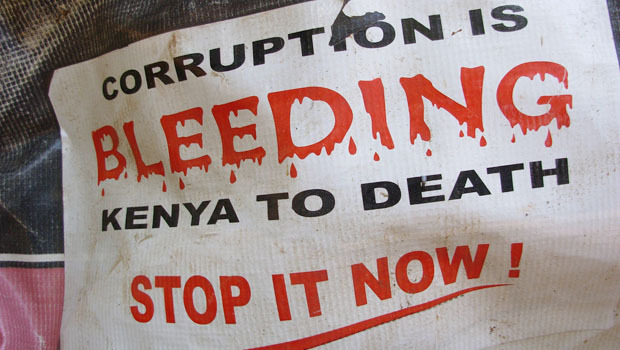 Ultimately, corruption is undermining Kenya’s global competitiveness. It has permeated so deep into society and it is now for us all to play our part in stemming. We need all the help we can get in killing corruption and we have some from Amcham. Following the president’s recent announcement of his commitment to address corruption in the country, American Chamber of Commerce has officially launched a working group to focus on good governance, responsible business practices and anti-corruption. “We support President Kenyatta in urging the Parliament to pass the private sector-championed Anti-Bribery Act. The act includes elements of transparency and accountability found in the U.S. Foreign Corrupt Practices Act, which for years has governed the way American firms interact with governments” explained Peter Njonjo, the President, AmCham Kenya. Here’s to a successful fight against corruption. The way we’re going, we won’t survive too long.